Völlig von einem Meister diese sauber renoviert, 1 Schlafzimmer, 1 Bad Kabinen verfügen über eine Küche mit einer vollständigen Palette, Mikrowelle und Mini-Kühlschrank. Mit dem Nötigsten benötigt, um selbst zu kochen, wenn Sie dies wünschen, eingerichtet. Wir bieten auch einige Lebensmittel aus lokaler Produktion Elemente wie frisch gerösteten Kaffee, lokal geernteten Honig und unglaublich Olivenöl und Balsamico-Essig. Wir sind bequem direkt am Highway 2 entlang der historischen Trap-line folgenden Flathead River Glacier National Park entfernt. Nur wenige Minuten vom Westeingang des Glacier National Park, Flathead Lake, Whitefish Mountain Resort, Glacier Int. Flughafen, mehrere Golfplätze, dem Flathead River und Wildwasser-Rafting. Unser Eigentum ist ein Nichtraucherhotel. My husband and I recently stayed in the cabins and we had such a wonderful time. Laura was always quick to respond and she was so helpful with all the details and had great information about Glacier National Park and the surrounding areas. The cabins were clean, comfortable and had everything we needed for our visit. We spent most of our time in Glacier, Whitefish and Columbia Falls. So many beautiful things to see! We stayed here during the second week of September. We found the cabin to be quite clean and comfortable. Everything worked fine. There are basic dishes and kitchen tools so you can cook simple meals if you are so inclined. 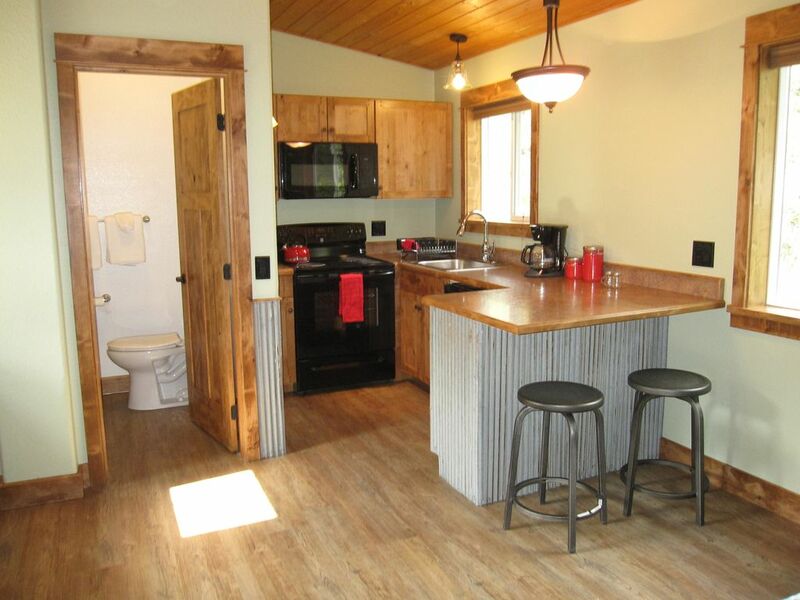 The cabin is very close to West Glacier and the west portal to the national park. The bed is very comfortable and the cabin heat worked well during those 30 degree overnights. Overall, a great experience!! The accommodations were very nice. Everything was clean and fresh. The only down side was that it was located at a busy intersection with a red light. Lots of traffic noise especially logging trucks and motorcycles. The up side was its closeness to the west entry to Glacier National Park. Nice new and clean. Owner is great. Loaned us bear spray for our hikes in park. Excellent spot to stay! Highly recommend. Stayed here for 3 nights with my best friend - the space was clean and hostess was great. Laura welcomed us promptly when we arrived. The kitchen and bathroom were well equipped with everything one could need. Fresh towels, shampoo/conditioner/body wash was also included. The kitchen had all the essentials - toaster, stove/oven, coffee maker (fresh coffee), pots/pans, mini fridge, and even aluminum foil. There was a grocery store called Smith's close by (in the family brand of Kroger), to save on food costs we shopped for our food needs there, packed our lunches and snacks, and used every aspect of the kitchen for dinners. The location is about a 15 minute drive to west glacier entrance and about 1.5 hours to east glacier entrance. It was a great place to return to after a day of adventures in and around glacier national park. Super comfy bed. I highly recommend staying with Laura - you'll be in good hands. Stayed here while we spent three days hiking in Glacier. Very nice place, full kitchen. Very convenient to Glacier, Columbia Falls and Whitefish. Would consider staying here for future trips to Glacier. Wir sind bequem in nur 15 Minuten vom Flughafen entfernt, 15 min entfernt. von Whitefish, 15 min. von Glacier National Park, 30 Minuten vom Ufer des schönen Flathead Lake. Wir sind nur 1 Meile von der Innenstadt von Columbia Falls, wo Sie speisen, finden Sie Lebensmittelgeschäfte und alle anderen Notwendigkeiten. Flathead River ist ein kurzer 1/2 Meile zu Fuß von der Tür. Weltklasse-Golf ist an mehreren Kursen im Tal. Ich liebe, im nordwestlichen Montana zu leben, wo Sie noch wilde Abenteuer finden können. Wildwasser-Rafting auf der Middle Fork des Flathead River. Fliegenfischen ist reich an Bereich Flüssen und Bächen. Rucksack, Wanderung, oder zu Pferd in Glacier Nationalpark. Besuchen Sie eines unserer weniger gereist Wildnis Zugang areas- Jewel Basin, Hungry Horse Reservoir, Great Bear, oder Bob Marshall Wilderness. Mountainbiker wird die Whitefish Trail System lieben oder genießen Fässer die Pisten in Whitefish Mountain Resort. Whitefish Mtn. bietet auch Hochseilklettern, Wandern und anderen Freizeitaktivitäten. Sag mir einfach, was deine Interessen sind und Chancen, dass ich jemanden kenne, der dir die große Tour geben kann. Ich bin seit Jahrzehnten hier und habe all die Flathead-Angebote genossen. Lassen Sie mich Ihnen helfen, den perfekten Urlaub für Sie zu planen! Full refunds up to 30 days before check-in date. Pet Fees are $25.00 per pet per stay.